Empty Leg Flights Archives | Jet Partners Worldwide, Inc. Empty leg’s have become a popular topic as many charter fliers are looking for a discounted way of flying private and others are surfing the web to try and fulfill that experience and cross flying private off their bucket list. Being knowledgeable about the topic can you help you in your future search. Empty legs are flights that are scheduled to fly without passengers back to their home base or to connect to an already scheduled charter flight or aircraft owners trip. In order to entice customers to jump on board of these flights the retail price on that particular aircraft is usually discounted anywhere from 20-35%, and as much as 50-60% if the scenario presents itself to work perfectly point to point to the schedule of the customer and operator. Many people wonder why aircraft owners or management companies wont just take a couple thousand dollars if the flight is just going to go back empty. Although that is factually true, aircraft owners can take the repositioned flight as a loss on their taxes in turn not actually taking the financial hit to their bank account. Most empty legs are geared to those fliers who are very flexible in when and where they want to go. For instance, if you don’t care if you left on a Sunday night or a Monday morning and are able to travel to White Plains opposed to Farmingdale you might be able to save money on your next private charter. Every scenario is a little different depending on the aircraft travel schedule and how badly that aircraft needs to move from one airport to the next to fit future trips. If you want to look at our open empty legs page on our website, we have hundreds posted each day and updated on an hourly basis. Below is a link, you can even sign up for e-mail updates if a specific routing you have in mind pops up in the future. As many people familiar with private jet charter flights know, finding an empty leg is the best way to get a good deal on a trip using a private aircraft. Empty Legs are flights that are scheduled to fly empty either getting into position for or returning from another charter. Sometimes the cost of these flights may be already paid for or subsidized by the person occupying the other end of the trip. In these such cases, empty leg flights may sell for a fraction of regular retail rates. The hardest part is actually finding empty legs that match the trip you need. Jet Partners has come up with a solution to this problem. Using our ‘Empty Leg Locator‘, you can actually see a listing of upcoming empty leg flights at airports near you. Jet Partners’ website is linked with the scheduling software for the largest database of private jets in the world. This means that as soon as these empty leg flights become available they are posted to Jet Partners’ site at the airport where they will originate. Let’s say, for example, you were looking for a flight from New York City to Miami sometime in the next few weeks. 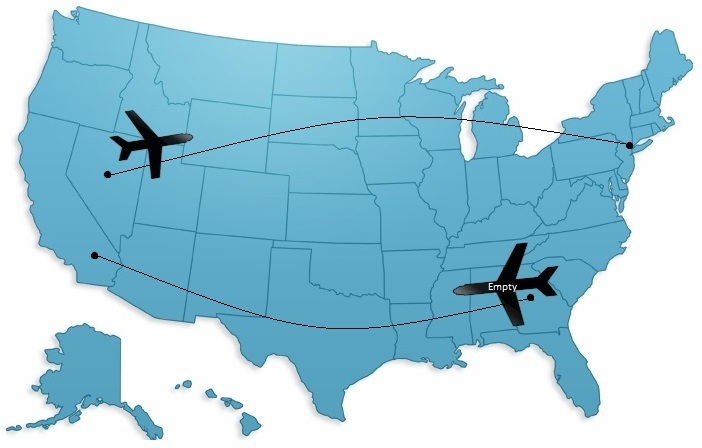 On Jet Partners’ site, you can click on world map, into the USA and then to New York or New Jersey. You can then look at the different airports surrounding NYC such as Teterboro, Westchester County, Republic Airport, and even the major hubs like JFK , Newark and LaGuardia. On these airport pages you will see the next 5 available empty legs, which type of aircraft they are on and where they are headed. You can also click a link just below the short list and see an even longer listing of empty legs that will show anything presently available, possibly months in advance. Many times the cost of a round trip charter flight might be very high due to the charges for keeping a private jet or aircraft at an airport that it is not based at during the trip dates. Other times you may actually be charged for twice the flight time as the owner of the jet will not want to keep the aircraft away for so long and you will be forced to purchase a double round trip. The best way to circumvent these costs is to get two true one ways for your departure and returning flights. If you are flexible on the airports you are willing to use and the dates and times you can fly than your best bet is to match up two empty legs. While this is not always an easy task, Jet Partners “Empty Leg Finder” is the best way to see what flights are currently available. Just like any other market, the pricing of these Empty Leg flights will have to do with supply and demand. Empty Legs during holidays and busy travel periods will typically not be discounted as much as when there are less people traveling. The pricing will also depend on how bad the aircraft needs to move. Jet Partners representative are extremely experienced in matching up empty leg flights for their clients. We will work with you to find the best aircraft that is suitable for your trip and budget. As was mentioned before, travelers who have some flexibility in when and where they can fly will be able to get the best deals on private jet charters. To learn more about empty leg charter flights or to start building you trip, call Jet Partners now. We are available 24/7 to help you with any charter flight request on private jets, turbo props and helicopters. Jet Partners is the undisputed industry leader in supplying empty leg flights. Let us help you find an empty leg match for your next trip and make flying private more affordable.